or simply give us a call at 1-800-303-7552. 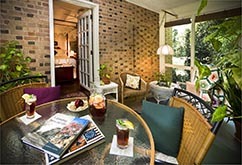 A reservation of one or two nights requires a one night room deposit. Reservations of three or more nights require a deposit of 50% of the total reservation cost. 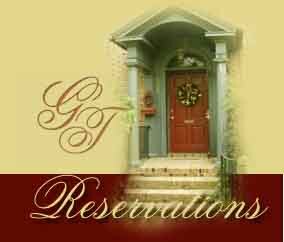 Any reservation made less than 14 days prior to the date of arrival requires full payment in advance. Payment may be made by Visa, Mastercard, or Discover. A two-night minimum stay is required on weekends and three nights over some holidays and special events. We accommodate adults only. This is a smoke free B&B. No pets. Take exit 238 off I-64 toward Colonial Williamsburg. Proceed 2/10 mile and turn right on Route 132 South. Turn left on Lafayette Street (2nd traffic light.) 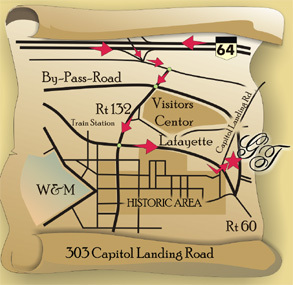 The first left off Lafayette is Capitol Landing Road. Governor's Trace is the second driveway on the right - 303 Capitol Landing Road. CANCELLATIONS: A full refund of your deposit will be made if cancellation notice is provided at least 14 days prior to the beginning of your reservation. If notice is less than 14 days, the full amount will be refunded provided we are able to rebook the entire reservation. A 30 day cancellation notice is required for the month of December and certain other long holiday periods. A $15 administrative fee may be charged for any cancellation.